Agongdian, in Chinese meaning Grandfather’s Shop, is also the name of Kangshan Dist before 1902. This water reservoir is built on the upper part of Agongdian River in Kaohsiung City. It is the first reservoir completed in Taiwan in the year of 1954. The two thousand meters (2M) long levee is still the longest one in Taiwan and Asia. Agongdian Reservoir is constructed with the functions of flood prevention, irrigation and water supplies for the region. More than its original functions, it provides also natural surroundings and great scenery for the tourist to visit. However, with a location near military base and in the remote countryside, it is relatively unknown to most people. Currently, the reservoir is open to public. 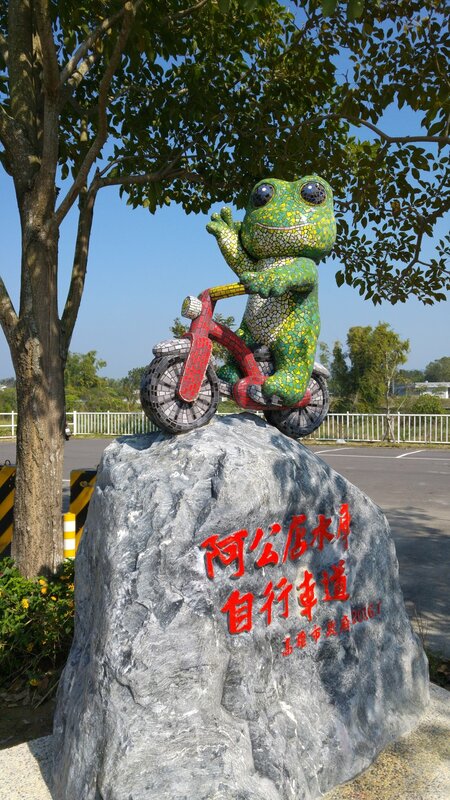 And everyone can enjoy their time along the well establish bike path by biking or simply walking, and you would always find local people jogging in the morning or afternoon because it is good to observe both sunrise and sunset on the crown of the levee. Just right next to the parking lot and tourist information center, you can find Kaohsiung City Bike Rental stop. You can easily rent a bike with your credit card or registered i-Pass card to enjoy this 7.5km bike path along Agondian Reservoir. When you enter the park, please say hi to this cute little fog riding a bicycle. This is the start of this bike path along the reservoir. You can find the 0km sign in front of it, and you will see more of the sign along the bikeway, so you have an idea of the distances rode. This bikeway is well paved and mostly flat, so you can bring your own folding bikes and you can cruise in any speed as you wish. There are two suspension bridges that you have to biking on in order to complete this trip around Agondian resorvior. Do not need to be afraid, it is strong enough to hold up to 100 adults on it at the same, so some bicycles with cyclists would not harm. Just relax and enjoy the feeling and breeze. Of course, the longest levee in Taiwan finishes up this wonderful bike ride, and you would have a totally different view of this short but special bike path like no others. Look at this little boy, who has totally enjoyed his free-ride on Kaohsiung city bike with his favorite snacks. You will also find your inner child again when you come to ride your bicycle in this small park. 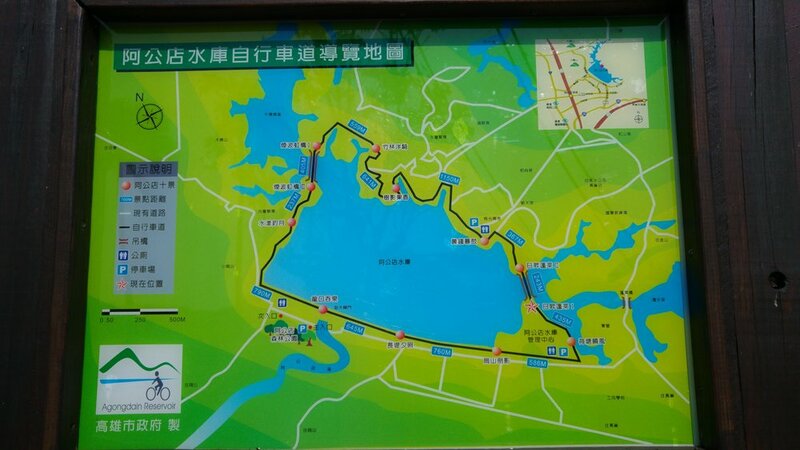 Agongdian Reservoir is only 8km away from Gangshan train station or South Gangshan metro station, where you can find a city bike to hire and come to this bike path as we did and shown in the bikemap plan below. Or you can drive or taking taxi to its parking lot and then simply ride along the bikeway and have a fun morning or afternoon. 2-3 hours are sufficient to plan for this attraction. Follow our latest rides on Facebook or Biking Taiwan Home.